If I live to be an old man, I want to geocache and obfuscate. My father was born in 1918 and grew up in the Depression. He liked messing with stuff. And since the Depression limited one’s ability to acquire pre-packaged “stuff to mess with,” he learned to combine stuff not-meant-to-be-combined to have a rollicking good time. You know, like the Little Rascals. In fact, my dad was the type of guy that may have been completely capable of feeding his awkward, crooning nitwit of a friend a soap sandwich for violation of the He-man/Woman-haters credo. He certainly would’ve tried to break up Miss Crabtree’s engagement. He was also capable of wiring a Model T coil to a metal pan, filling it with chicken feed and watching a stupid huddle of chickens alternate in piston-like jumps while continuing to feed. As a kid, this of course translated to the use of “invisible ink,” which turned out be the not so vainglorious use of lemon juice with the heat from a lighter as the revealing catalyst. I then got a copy of Alvin’s Secret Code when I was a little kid (and I have that exact copy to this day, acetone yellowing and general bibliographic rigor mortis notwithstanding). I was hooked. Me and the cipher would forever be associated. And I looked up the author, Clifford B. Hicks. Dude kept the magic rolling until the age of ninety. So while Diane sawyer was practically slamming back straight shots of whiskey on the Rose Line to commemorate the cinematic premier of The Da Vinci Code’s obfuscatory slap on the Deity of Christ, I was just finishing the book, completely infatuated with the idea that there may be hidden messages—and completely able to distinguish that from the idea that those messages might be stupid. Dan Brown was no idiot. He made a million selling a stupid idea wrapped in the coolest of vehicles: The Hidden Code. His book, of course, gave way to a literary high colonic of books trying to bridge cryptography, the Illuminati, and the Rene les château. Most of them lame, to say the least. I say that because I think the authors failed to see the magic in the mystery, and rushed to print with their little algorithms involving the appealing elements of church corruption, car chases through Rome, and some codex buried underneath the cornerstone of some masonic temple. But I’ll explore all that another day. Even Walt Disney was capable of hiding things in plain sight. But even if his clandestine Easter Eggs weren’t so centered on ciphers, his penchant for cars, haunted houses, pirates, Mark Twain and Swiss Family Robinson proves beyond a shadow of a doubt; he wanted to keep it magical. This is, of course, the allure of Geocaching—a combination of codes, GPS searches, hearsay, artifice, ruse, subterfuge, and the occasional “20 paces . . . “ crypto-cartographic pirate lore tossed in for good measure. I have a few of these planted myself, most notably, Davy Jones’ Foot Locker. And I’m in my late forties, people. He made this for Meriwether Lewis. He didn’t make this in a vacuum, however. This cipher actually bears similarity to one published in 1516 by a Benedictine Abbott in Germany. It is what is called a Substitution Cipher. 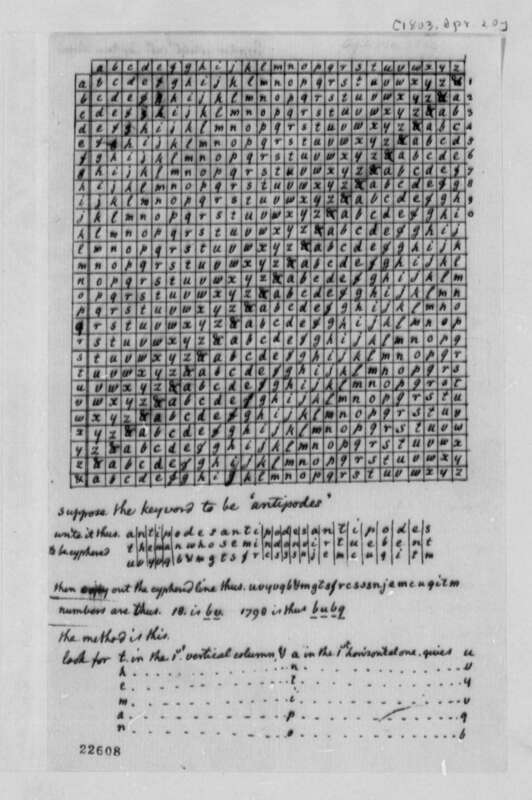 The same kinds of ciphers Hicks was using in Alvin’s Secret Code. Same kinds of codes explored in National Treasure, which of course channels Jefferson—or at any rate, lives off his fumes. And made me at least temporarily think Nicholas Cage could act. Come to think of it. All this stuff seems to emanate from the minds of men who refused to fully grow up. And there’s something in that, I think. This entry was posted in Books, Uncategorized and tagged ciphers, clifford hicks, code, da vinci, dan brown, national treasure, nicholas cage. Bookmark the permalink.